Thread: If you use fleece for backing, how do you bind it? 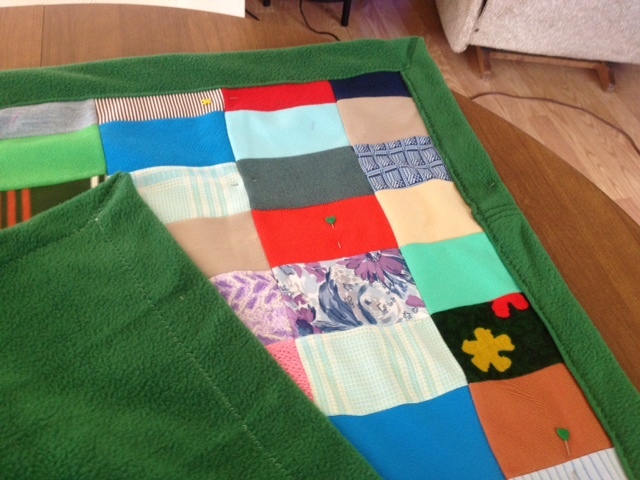 I have a friend going through a rough patch and thought I'd make a lap quilt to let her know I'm thinking of her. I'd like to use fleece for the backing so that it's extra cuddly and I will skip the batting. Since I've not done fleece before, I'll probably use a good quality polar fleece but avoid Minkee since some have said it's extra challenging and slippery. But how do you bind with fleece backing? Use the traditional cotton binding? Do you need to cut it any wider to allow for bulk? Any tips? I've never done a fleece backing, but would assume that if the seam is thicker it would require a wider binding. It's a kind thing you are doing for your friend. I use 2 1/2 binding with fleece, have not had a problem, with no batting it is not too thick. When I bind a quilt with cotton, front and back I normally press the binding, I skip this step when using fleece. I used a 3" binding when I did the fleece quilt I made. Very nice of you to be making a quilt for your friend! I've done the binding as usual with 2-1/2" strips or with just pulling the backing to the front. It is not any more bulky than binding a quilt having batting. I just folded over about an inch of the backing and use the blanket stitch on my machine. Yes, it showed on the back but everyone I showed it to just loved it, including the person who received it. I wasn't interested in stitching thru all those layers of fleece. I have always folded under 1/4 - 1/2 inch around the top and sewn it down to the fleece. Then trim the fleece about 1/2 inch wider than the top and left it unbound. Sometimes I cut fringe on the sides. Since fleece doesn't ravel it works well for me. I just finished 2 kids quilts using fleece for the back plus batting. I used a 2.5" binding which I sewed to the back and then machine top sewed to the front, also another first for me which I loved. I was concerned about binding mine, too, but they turned out great. I've done them both with cotton and fleece. The cotton binding was 3 inches. I sewed the edges of the quilt before I attached the binding in both cases. I also did one with the fleece, I only use a single fold binding, cut it 3 inches, sewed on the front as usual and hand stitched the back. Both ways were fine but I liked the look of the fleece binding. I just folded my backing from the back to the front mitering the corners and stitched down. I recently made a denim scrappy quilt for a boys' charity and I used fleece for the backing, with no batting. I finished it by doing the "birthing" method, then topstitched about 1/2" from the edge all around and did minimal quilting, enough to keep the fleece from shifting. Thought it turned out just fine and it finished up very quickly. I used the "no-pill" fleece from Joanne's. Thanks to all for your replies! Looks like there are a number of options for this. I hope to get the quilt cut out this weekend. I'll get the fleece once I know what size the quilt will be. I used a packaged satin blanket binding. I put it on with a decorative stitch. Looked fancy! I do my usual 2 1/4" binding. I make these all the time, even if I put in batting I still use 2.5" on my binding. I just use cotton like I use on the top. Fleece is VERY EASY to quilt! In fact, I just bought some fleece yesterday to use as backing on a quilt I am making for my neice. I have just used 2 1/2 fleece binding. Works just fine. I would finish it pillowcase style. Don't have to deal with binding then. I also used a 2 1/2 inch binding and have made 3 quilts with fleece backing. You are right, very cuddly and I did it the same way you would bind an all cotton quilt. The fleece may feel thicker but it works great in the machine without any trouble. I'm sure she will really appreciate your thoughtfulness. I just finished backing 2 double knit lap quilts that my Mom had made the tops (many, many years ago), with fleece. I made it about 2 1/2 inches bigger than the top, all the way around, then I folded to the front and did a zig zag stitch on the edge. I was going to give them to a nursing home, which was why my Mom used up her scraps that way, but my Hubby said "I want the 1st one, and my son said " I want the 2nd one" so guess we will recycle at home 1st!! Good luck with yours. Lots of good ideas here...glad for the reassurance that fleece is pretty easy to work with. Gmavis, thanks so much for the picture! Good to know your family will enjoy your mother's work. I make fleece qullows all the time. I serge the edge of the quillow (or zigzag it if you don't have a serger) this makes for a nice firm filling for the binding. I use 2" French fold binding and first stitch the binding to one side and then simply fold it over and stitch to the other side just inside the original stitching and it comes out perfect every time! !